Clean Cities Sweep takes place in March and April. It is a call to action for the community to plan volunteer cleanup and beatification. Most projects average around 2 hours, and they can be any event that helps the community and the environment. Groups should register their projects, which can be completed anytime February though April. Upon registration, project coordinators will receive a confirmation email/phone call to schedule a supply pickup date. Litter cleanup supplies are lent out to groups, and include GLAD trash bags, gloves, trash grabbers, visibility vests, first aid kits, hand sanitizer, and other necessary supplies. Groups can also plan beautification events, in additional to litter cleanup events. The first 10 community groups to register Clean Cities Sweep projects will receive $100 worth of project related supplies. This funding is so graciously provided by Palmetto Pride and Keep South Carolina Beautiful. 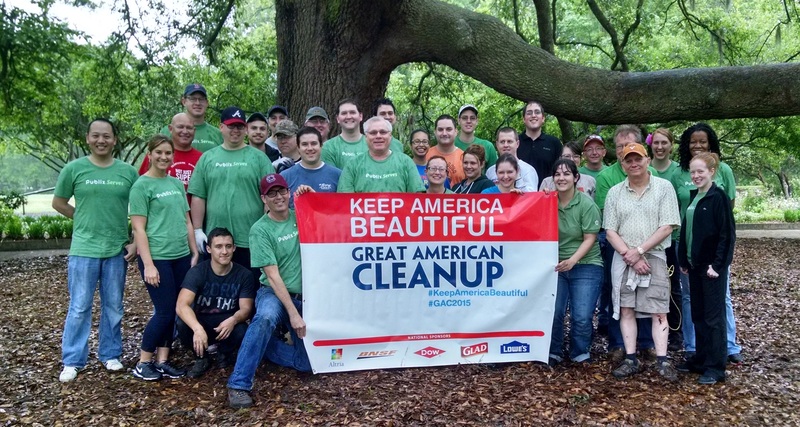 We look forward to working with your group to make Charleston litter-free and beautiful! Following completion of the project, neighborhood association groups will be eligible to apply for the Georgia Smith Award (Winner receives $50 and recognition at City Council). Awards are based on final reports and before and after images of the project. Volunteers and individuals who do not have a group or project and wish to join forces with KCB can volunteer for 2 hours on Sunday April 28th at 10:00. Location will be determined and promoted on our Facebook Page, and all ages are welcome! Register Your Clean Cities Sweep Project Online Here!